Are you looking to add a little love in your life? Do you go weak in the knees for a man in uniform? The G.I. 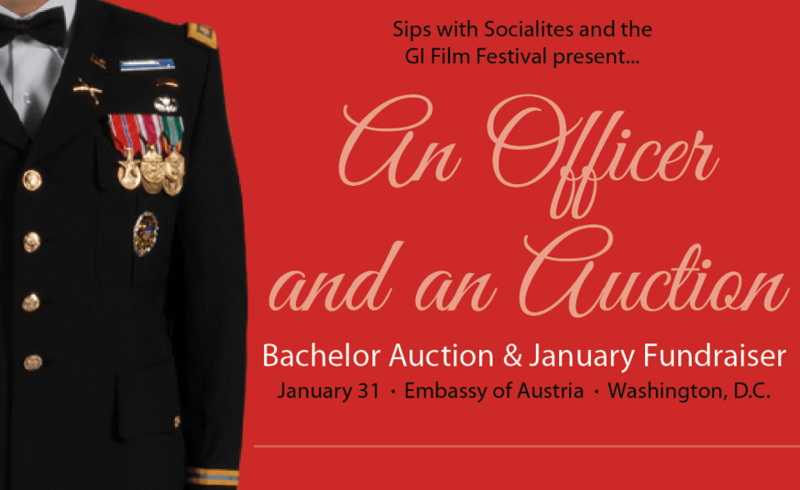 Film Festival is holding a fundraiser bachelor auction that will let lucky ladies bid on a night on the town with an officer from the Navy, Marines, Air Force and Army just in time for Valentine’s Day. “An Officer and an Auction” will be held Thursday night at the Austrian Embassy in Washington, D.C. The event, presented jointly by Sips with Socialites and the GI Film Festival, will feature drinks, appetizers and music in addition to the live auction. Two naval officers, both reservists, will be participating in the auction. Here’s a little more information on them below. Why he’s participating in the auction: I’m a fan of the G.I. Film Festival, and I heard about this way to raise money for it. It’s not something I’d usually do but it’s for a good cause. His ideal woman: Somebody who likes to have fun, and doesn’t take themselves or me too seriously. Somebody that’s fun to be around and takes life as it comes. His perfect first date: Just trying to get to know them better, it’s probably obvious, but a nice dinner and some wine. It doesn’t have to be anything fancy, just something to show where you connect and what you have in common. Why he’s participating in the auction: I think that films have a way of capturing the unique stories of military members especially when we see so often these days military members often portrayed as heroes … I think it’s good to balance that with their stories, and some stuff I’ve been through too, about sacrifice, duty and how much they miss family. His ideal woman: I enjoy a good sense of humor. I like laughter; I actually like being laughed at and poking fun at myself. I think I’m pretty goofy. … As far as long term, I’d really like to find a girl that likes to travel as much as I do. I travel a lot with the Navy reserve as a pilot and end up in pretty exotic places sometimes … I like trying new things. I wouldn’t say I’m an adrenaline freak, but I like snowboarding, scuba diving, skydiving, I just tried trapeze for the first time. Just recently I did diving with whale sharks last month, and I would love to do cage diving with great white sharks. If someone wants to do that, that’d be great. His perfect first date: No movies, it’s not a good way of getting to know someone. Anything that would allow for getting to know one another, but it doesn’t necessarily have to be a meal or drinks. I’m all for doing different activities,like a game of pool or darts.